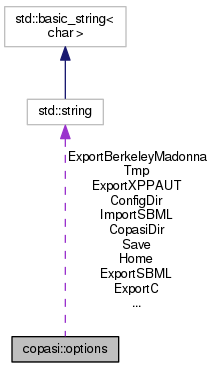 the following struct is used to hold the values of the options. It has a constructor that sets all the option values to their default value. Definition at line 65 of file COptionParser.h. Definition at line 67 of file COptionParser.h. Definition at line 75 of file COptionParser.h. Definition at line 76 of file COptionParser.h. Definition at line 77 of file COptionParser.h. Definition at line 78 of file COptionParser.h. Definition at line 79 of file COptionParser.h. Definition at line 80 of file COptionParser.h. Definition at line 81 of file COptionParser.h. Definition at line 82 of file COptionParser.h. Definition at line 83 of file COptionParser.h. Definition at line 84 of file COptionParser.h. Definition at line 85 of file COptionParser.h. Definition at line 86 of file COptionParser.h. Definition at line 88 of file COptionParser.h. Definition at line 87 of file COptionParser.h. Definition at line 89 of file COptionParser.h. Definition at line 90 of file COptionParser.h. Definition at line 91 of file COptionParser.h.